Which beast does Vector tame the best - the bull or the bear? Warren Buffett once said: “only when the tide goes out do you discover who’s been swimming naked”. Well, with the following short analysis we hope to show you that - ever since we went skinny dipping in 2008 - we now only go swimming when fully decked out in diving-suits. We use the 15th of April as the sample split date as this nicely separates this year’s bull and bear market. The analysis ends on the 31st of August. 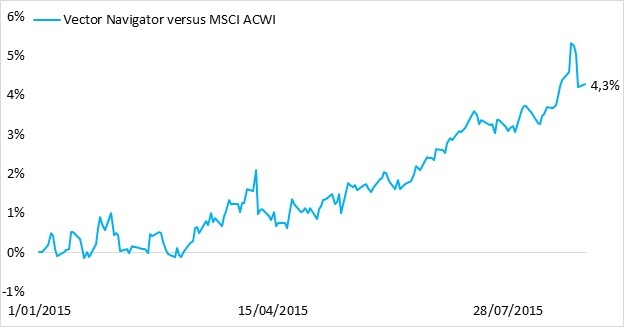 The graph above portraits the 2015 return of Vector Navigator on the one hand, and the MSCI ACWI (NR eur) on the other hand, showing how markets reached their highs halfway April, and lost most of that gain in the following months - especially in August. The second graph portraits the relative performance of the fund over the same period. While we beat the index in both market states, the majority of the outperformance was actually earned during the bear market period. In absolute terms, we beat the MSCI ACWI with 2.81% (annualized) during the bull market, which is a solid performance. Yet, our annualized alpha of 8.14% during the subsequent market correction was considerably more outspoken. With respect to our Morningstar Category we see that our outperformance was actually more concentrated in the bull (6.44% annualized) than in the bear (4.52% annualized) period, which might have something to do with the average fund manager’s addiction to hold cash in good and bad times. Nevertheless, we are still outperforming substantially in both market states – there are undoubtedly worse things a fund manager would want to report. In summary, these findings confirm the information we had previously distilled from back-tests and from the smaller corrections the markets had experienced ever since 2012: the model seems to be well equipped to handle all the different regimes that the stock markets are willing to throw at us.